The Band's 2013 Season Begins June 16, 2013! 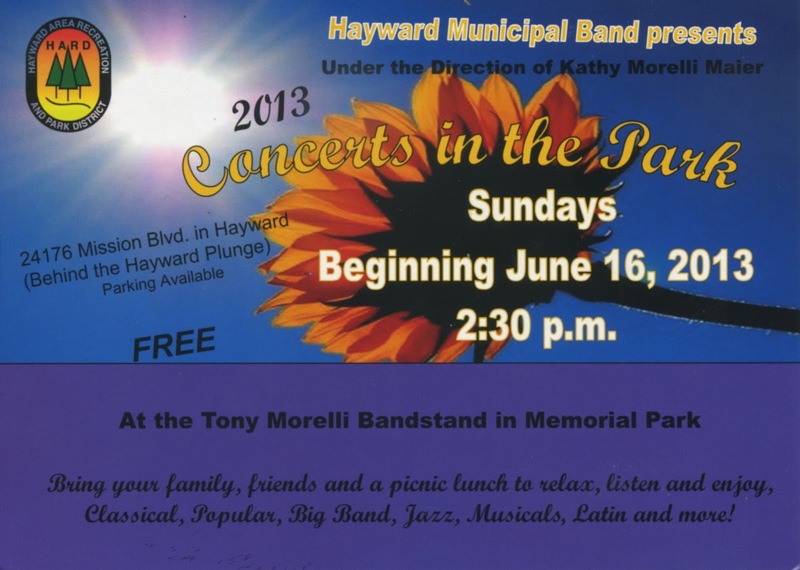 The Hayward Municipal Band, under the direction of Kathy Morelli Maier, will begin its 57th concert season on Sunday, June 16th at 2:30 on the Tony Morelli Bandstand, 24176 Mission Blvd. (behind the Hayward Plunge). City of Hayward and the Hayward Area Recreation and Park District. Parking is available. If you have attended a Hayward Municipal Band concert in past years and signed up on our mailing list, you should have received this colorful postcard in the mail recently. Please attach it to your calendar or refrigerator and make plans to join the band for another season of wonderful, free outdoor concerts in Hayward's beautiful Memorial Park. What could be better than a fine summer afternoon spent hearing live music in the park--for free? The Hayward (California) Municipal Band has been delivering the goods since 1957! Please be sure to check out the entire post here. And Steve, we hope to see you on the lawn again in 2013! On Memorial Day, Monday, May 27th, the Hayward Municipal Band participated in the annual program at Lone Tree Cemetery, 24591 Fairview Ave. in Hayward. The band played a concert starting at 10:30, and participated in the formal program which began at 11:00. Thank you to everyone who turned out to hear the band and to honor those who gave the ultimate sacrifice in service of their country.